Johanna Senfter (Duitsland, 1879 -1961) was studente was bij Max Reger. 134 werken liet zij na, waaronder 9 symfonieën, 26 orkestwerken, kamermuziek, koormuziek, én orgelwerken. Weinig daarvan is gepubliceerd en na haar dood in 1961 gingen de manuscripten naar het Conservatorium in Keulen. Net uitgebracht door Paladino Music is een dubbel-cd met werken voor viool. Noch sind wir ein Wort ... is the title of the portrait-CD of the winner of the Erste Bank Kompositionspreis of 2016, Eva Reiter. Eva Reiter's music is a speculative approach of the basic elements of music. She not only examines the musical elements and orders them in an analytically "correct" fashion, but also renders audible a world that previously, had yet to exist. The London-based Marsyas Trio, formed in 2009 by graduates of the Royal Academy of Music, is dedicated to music for flute, cello & piano from the Classical era to the present day. This album presents trio works by women composers of multiple generations; five of them living British composers, and one notable American. The release marks the 100th anniversary of (some) women getting the vote in the UK, and celebrates the diversity of compositional style, the wealth of talent, and accomplishments of living British women composers today. The album includes five premiere recordings: Judith Weir's Several Concertos, Thea Musgrave's Canta, Canta!, and recently commissioned works for the trio by Hilary Tann and the two youngest composers on this album: Georgia Rodgers and Laura Bowler. Radio Monalisa will be presenting these works in the upcoming shows. action music pieces in the title of Lucia Ronchetti's new cd, a collection of 5 theatrical instrumental pieces performed by Ensemble Intercontemporain and the Orchestra della Tosacana. Read more >> Kairos - 0015027KAI and listen to a few tracks which will be broadcasted on Sunday, November 18th via Radio Monalisa. One of the UK’s most lauded composers, Roxanna Panufnik celebrates her 50th birthday with a new release of her previously unrecorded choral music, performed by leading British choir Ex Cathedra under Jeffrey Skidmore. Known for her interest in world music, the program includes performances from Indian arts organization Milapfest on Unending Love, as well as the a recording of Child of Heaven: Dawn Chorus III – a new commission from Ex Cathedra that sets a Hymn to Dawn from the Rig Veda. Composer Monica Houghton (Vermont, 1954) has a musical and academic resumé that is made even more exceptional by her experiences as a true citizen of the world. Her travels around the globe have led her to incorporate non-Western instruments and musical practices into several of her compositions as well as to find inspiration trekking through Peru, or by exploring the remote and desolate areas of the American West. On her new CD, OF TIME & PLACE, Houghton incorporates these influences along with many others to deliver eight stunning performances showcased in a variety of musical configurations. The five compositions on this album are inspired by the lives and works of five women from history. Carlotta Ferrari (Italy, 1975) has composed numerous pieces inspired by historical figures as well as pieces inspired by literature and works of art. Several of these directions are brought together in the five compositions on this album, which celebrate three religious figures, an artist, and a writer. In Ferrari’s distinctive modal style, she creates expressive musical portraits of these women. There were many highlights to her musical career: the concerts she gave in the Netherlands between 1968 and 1989 feature prominently among them. This CD is a faithful rendition, thanks especially to the remarkable audio quality. Blossom Dearie masterfully performed in all the instrumental formations, from solo shows to the great Metropole Orchestra. She sang repertoires of every kind, from film music – she brought a new dimension to “Raindrops Keep Falling on my Head” – to Joni Mitchell’s “Both Sides Now”, sensitively revisited. Not to forget a masterpiece whose music she composed, “Winchester in Apple Blossom Time”, with Marilyn Monroe-style boo-be-doops – two superb versions of which can be enjoyed here, as well as her other compositions, those mentioned, and “Bring All Your Love Along”, whose first recording, made in Laren, 1982, is featured here. In 2015 Coastal Jazz and Blues Society in Vancouver, BC commissioned Peggy Lee to compose a suite of music for a new 10-piece ensemble. The intent was to create an ensemble including some of the most active and interesting improvisers on the Vancouver scene, both veterans and younger players, all highly accomplished artists and leaders of their own projects. Echo Painting was premiered at the 2016 Vancouver International Jazz Festival. With many colors to draw upon, the music is multi-layered, texturally varied and melodically rich. From driving rhythmic vamps to incendiary improvisation to achingly beautiful melodic compositions, Peggy Lee takes anything she touches to a deeper and more artful level creating “music that combines the timeless and the otherworldly in equal measure” (Georgia Straight). Jazz composer - big band leader Hazel Leach has been the musical director of The Composer's Orchestra Berlin since January 2011; a large orchestra with strings, horns & rhythm section. The members of the orchestra are not only improvising instrumentalists, but are also the composers. The music written for this band has no exclusion zones, combining elements from all possible styles to create music which is truly Free-Range. Their first orchestral CD dates from December 2013 and now their latest album Postcard Collection has just been released. Listen to our show on Sunday April 15th for a preview of this delightful album. Tour de Force is de title van de nieuwe cd van pianist Eliza Garth. Zij speelt hierop ondermeer de 13 Piano Preludes van Sheree Clement, gecomponeerd over een periode van bijna 40 jaar. Vol verrassingen, gekenmerkt door een zoektocht door tonaliteit en zeer complexe ritmische passages lopen, vaak gehinderd door abrupte onderbrekingen of ondoordringbare omwegen. Eleven tracks of jazz music for flutes, vocals, saxophones, piano, double bass and percussion is what you'll find on Panuya, the new cd by Sicilian jazz composer/flutist/singer Anna Ventimiglia. Listen to a few tracks in our show on Sunday, February 18th. Spil achter Facetten van de kunst is violist/componist Julia Barnes. Fvdk verbindt regionale kunstenaars met elkaar en met hum omgeving. De daar uit voortvloeiende kunstprojecten zijn avontuurlijk en informeel, en brengen professionele en amateur kunstmakers en publiek samen. Nu is er een cd verschenen naar aanleiding van hun laatste project Pomes Penyeach. 'inspired by’ James Joyce. Op de CD Old Heart's Wisdom staan 10 composities voor sopraan, baritone, strijkers, en slagwerk (2016) en de Suite Joyce in Lust (Love) uit 2017 voor stemkunstenaar, slagwerk en altviool. Mary Lou Newmark is an electric violinist, composer, and poet living in Los Angeles, California. Her compositions are far from traditional, bridging the gap between current trends in electronic music and the virtuosic violin techniques of the past. Her work incorporates live performance, original poetry and electronically processed sounds. The results are unique pieces that inhabit their own musical ecosystems. Hew new cd Room to Breathe is a safari into the urban wilderness of Los Angeles with her green electric violin. The music moves across genres to encounter wild birds, coyotes, a wolf woman, beats, and poetic verse. Largely neglected following her death, the music of Poldowski – alias of Irène Régine Wieniawska – is brought back to life in this re-imagining by David Jackson, director of the Paris-based chamber group Ensemble 1904. With twenty-two settings of poems by the nineteenth-century French poet Paul Verlaine, Ensemble 1904 makes its recording debut with this alluring and compelling program of art song. Poldowski’s complete Verlaine settings are united for the first time in vivid arrangements by David Jackson inspired by the composer herself, known to have made chamber versions of her own songs. Included is the world premiere of the recently rediscovered Nous Deux. Listen to a few tracks in our program on November 19, 2017. De Cubaanse zangeres Estrella Acosta ging op zoek in de rijke en mooie muziekgeschiedenis van Cuba. Ze ontdekte nieuwe en originele stukken door vrouwen gecomponeerd. En nu presenteert zij die songs met een band van 8 musici in het programma Mujeres de Luna - Women in Cuban Music. Het zij top latin-jazz musici en het Pavadita strijkkwartet die haar begeleiden. T/m december van dit jaar door heel Nederland. En er komt een cd uit; de presentatie daarvan is op 29 oktober 2017 in Amsterdam in het Bimhuis. Music teacher, conductor, writer, editor and composer, Imogen Holst (UK, 1907-1984) was the daughter of Gustav Holst - on whose life and works she wrote the definitive studies. She studied at the Royal College of Music, was director of music at Dartington Arts Centre between 1943 and 1951, before moving to Aldeburgh to become a Co-director of the Festival and Britten's personal assistant from 1952-64. Her later years were mainly devoted to editing, recording and promoting her father's music. Although she only composed when asked to do so, she left a small, useful and distinctive output. Love's Signature is the new cd featuring 3 song cyclus, songs for countertenor and soprano by Juliana Hall. and PROPRIETY (soprano Susan Narucki and pianist Donald Berman). An exciting cd including the following works by this French composer: Variations pour flûte et piano op.11, Vocalise pour Alto op.53, Quatuor pour clarinette et trio op.22, suite pour violoncelle op.41, suite pour orchestre à cordes op.42. De internationaal geprezen componist Anne Vanschothorst (1974) werkt voor het indie label HSM (HARP AND SOUL MUSIC) en behoort wereldwijd tot de meest creatieve en onconventionele harpisten. Zij produceert originele muziek - met de harp als basismateriaal - voor film, multi-media en kunstprojecten. Kate Whitley (UK, 1989) is a composer, pianist, and producer. Awards include a 2015 British Composer Award, a 2014 Borletti Buitoni Trust Special Award and the 2013 Sky Academy Futures Fund Bursary for her work in bringing classical music out of the concert hall and into new contexts. This new release by Kate Whitley in NMC's Debut Discs series comprises a wide-ranging repertoire – from piano miniatures and chamber works to a concerto and the album title track for children’s choir and The Multi-Story Orchestra. With lyrics by poet Sabrina Mahfouz that imagine a world which ‘beats with beauty’ and cautions against human abuse of nature around us, I am I say is performed by soprano Sarah-Jane Lewis, bass Ashley Riches and a choir made up of children from three South London primary schools. RAW is Anne La Berge's latest release as an LP. It is a work that asks the musicians to improvise on unfinished musical material and to collectively create a work in real time as they are given ongoing random choices to make. RAW embraces the unpolished and unbridled opportunities that unforeseen combinations offer us to respond to in the process of making art. Guitarist Heike Matthiesen's new CD features lyrical music by Madame Sidney Pratten, Maria Luisa Anido, Ida Presti, Sofia Gubaidulina, Sylvie Bodorova, Annette Kruisbrink, Tatian Stachak, Carmen Guzman and Maria Linnemann. In the coming weeks Radio Monalisa will broadcast a track or two for your listening pleasure. In the meantime read Thea Derk's interesting article about the CD here>>. Cappella Clausura was founded by Amelia LeClair in 2004 to research, study and perform the music of women composers, and to bring engaging performances of this music to today’s audiences, thereby bringing women composers into the classical canon. The ensemble’s name honors the music written by 17th century Italian nuns who were cloistered, in clausura (covered or hidden away, segregated from public life). Cappella Clausura takes the name as a metaphor for the cultural obstacles faced by women composers throughout history. Dit najaar verscheen een dubbelbiografie, portret van een huwelijk over Ferdinand Bordewijk en zijn vrouw Johanna. En in december verscheen een cd met de titel From the bottom of my heart, een cd gewijd aan de kamermuziek van Johanna Bordewijk-Roepman. Zij stoorde zich aan geen enkele muzikale mode en ging volledig haar eigen weg. Haar muziek kenmerkt zich enerzijds door diepe ernst en emotionaliteit, maar kent ook humoristische trekjes. Met zangers Irene Maessen en José Scholte, violiste Ursula Schoch en pianist Marcel Worms. As a composer Aliona Yurtsevich is developing her own unique style, exploring the traditional abilities of acoustic instruments with the emphasis on theatrical aspect of performance on stage, live electronics, sound spatialization and sound itself. Her work leans towards the experimental multidisciplinary sound-theater exploring musicality of the visual and the visuality of the musical performance. In the stillness between two waves of the sea is the new cd with various works that she completed between 2007 and 2011. Katharina Gross (cello) plays works by Raphaël Languillat, Jakhongir Shukur, Johannes Kretz, Seung-Won Oh, Christopher Wood and Veronika Simor. "cellomondo: the excitement of moving through a multitude of sound worlds, of music from all around the globe. To learn the mother tongue of many composers and to tell their stories to the audience. This is the start of a project which boldly envisions to include composers from all countries. If I succeed, 388 new pieces will have been realized…"
Emily Howard (UK 1979) had an wonderful premiere this summer during the BBC Proms, and now her debut cd has been released. Tje title work on this debut disc, Magnetite, was written for the Royal Liverpool Philharmonic Orchestra when the ensemble’s home city – also Howard’s – was European capital of culture in 2008. Her interests, embracing mathematics, physics and poetry, inform each work, whether specifically (Solar) or more obliquely (Leviathan). Afference (2014), for string quartet and in two parts, takes ideas of sensory perception as a starting point. The results are delicate, detailed and rigorous. This is an engaging introduction to Howard’s music, expertly played. Accompanying Herself is the new release by violinist/composer Aleksandra Maslovaric. Previous releases included her concerto and sonata albums featuring music by women composers. And now she continues on her mission of exposing hidden gems by women composers, with an intimate collection of thirteen solo works by nine composers. Home is the debut solo album from bassist Eleonore Oppenheim. It is a musical journey in which each track represents a different approach to the double bass as a modern solo instrument, and to the ways in which it can interact with electronic media. Home unleashes the double bass from its traditional obligations and takes the listener on a surprising, unbound journey through different sound stages which explore the breadth of the instrument’s emotional and physical range. Several of the pieces also incorporate Oppenheim’s unadorned, folky voice, which blends and dialogues with the bass, acting both as another texture and as an offshoot of the instrument. With music by a.o. Angelica Negron, Jenny Olivia Johnson and Lorna Dune. The double-album SEPARATION is a representative cross-section of Paula Diehl’s music with an emphasis on the last three decades, the period in which her compositional voice flowered most fully. Expansive orchestral scores such as Insiders (1994) and more intimate chamber works like On Course (1984) speak clearly to the singularity of Diehl’s style and provide a nice reminder that it is often those on the periphery, those who are pushed outside instead of welcomed inside, who frequently have fascinating things to say. Dankzij violiste Aleksandra Maslovaric, heeft Elisabeth Kuyper (NL, 1877-1953) weer een plek op de muzikale kaart. Op deze cd het vioolconcert in b klein, opus 10 uit 1910 en de sonata voor piano en viool opus 1. Kuyper: Rediscovering a Dutch Master. Just out is the new cd Photography with four orchestral pieces by Errollyn Wallen (Belize, 1958). Her music is both immediately familiar and entirely original. She combines popular styles, aspects of minimalism, baroque counterpoint, modernist rhythms, and lush romantic textures and draws on influences around her. Many of the works on this album have personal associations and are written for long-standing musical collaborators and friends who appear on this recording. With VANBINSBERGEN PLAYSTATION Corrie van Binsbergen picks up the threads of her instrumental earlier bands. After twelve years of mainly focusing on projects with literature and composing for large contemporary ensembles, theater and film, the time was ripe for this energetic all-star superband. Like before there are no boundaries, no limiting styles, but her own: energetic, bold and playful. A dynamic live CD! The untitled ECM double album debut of Norwegian saxophonist, composer and improviser Mette Henriette (Norway, 1980) is an arrestingly original musical statement. Jazz players and classical players are drawn together in her ensemble, but the music shapes its own world, outside genre definitions. And listen to a track in Radio Monalisa on Sunday January 10th. '….eindelijk een cd is die de schijnwerpers richt op de veelzijdigheid van Vanessa Lann. Haar subtiele oeuvre verdient het…' aldus Biëllla Luttmer (Volkskrant ). Op de cd Moonshadow Sunshadow 7 werken die Vanessa Lann in de afgelopen 25 jaar schreef. Luister naar de titeltrack in de laatste uitzending van 2015 op Radio Monalisa. En ook in de eerste uitzending van 2016. Dan is Resurrecting Persephone te horen met fluitist Eleonore Pameijer en het Radio Kamerorkest olv Kenneth Montgomery. Sorel Classics has just released the world premiere recording of Pure, Cool (Water) - Symphony Nr. 4 by Judith Lang Zaimont. This new five-movement symphony has been conceived as an exploration of the various states of water - rapid/running, falling, still, frozen, rolling. This symphony is another in a long line of Zaimont pieces for various forces which celebrate the wonders of the natural world. Also on this disk the first piano trio by the composer entitled Russian Summer. With the Janacek Philharmonic Orchestra and conductor Niels Muus (Symphony Nr. 4). Peter Winograd, violin - Peter Wyrick - cello and Joanne Polk, piano (Russian Summer). The Singing features works by Sally Beamish composed between 2003 and 2012. It is a continuation of the inspiration she has found in Scotland; its landscape and history. And also it reflects her interest in jazz and Scottish traditional music. The title track is a concerto for accordion and orchestra (with accordionist James Crabb) followed by a.o. a Trumpet Concerto with Håkan Hardenberger and Branford Marsalis as solist in Under the Wing of the Rock for alto saxophone and strings. Radio Monalisa is focusing on Sally Beamish's music over the next few months. See our programming or on-demand pages for more details. Ikue Mori is an award winning musician, having started her career as a drummer, then moving into sampling and laptop electronic music. She has worked with members of Sonic Youth and Henry Cow, with John Zorn among others. Her new cd Light in the Shadow consists of ten tracks of soundscapes making references to traditional Japanese music, middle eastern beats, 50's exotica, and 80's experimental noise. Louth Contemporary Music Society release The Song of Songs featuring world premieres by David Lang and Betty Olivero. Radio Monalisa on Sunday September 13, 2015. In this solo debut album, Jenny Olivia Johnson explores the subject of early childhood and adolescent trauma. The album’s five musical works—scored for voice, small chamber ensemble, and electronic sounds—profile characters who undergo the emotional aftermath of extreme experiences. Award-winning composer Jane Antonia Cornish has already made her mark in film scoring with the music for Fireflies in the Garden and the orchestration for Once Upon a Dream for Maleficent as well as the title song for Big Eyes. Continuum shows her in concert mood, albeit still lush and atmospheric. Called "one of the wonders of world trance music," by the Los Angeles Times, Mamak Khadem captivates audiences by blending her roots in the ancient poetry and music of the Persian masters with a bold and revolutionary new sounds. By nature a nomad, she thrives in open spaces but by occupation, she is a bridge connecting geography to lore. Mamak weaves a canopy at once simple and rich, inspiring an awareness and appreciation of Persian arts and culture through a blending of old and new. A Triple Portrait is the title of a new release with chamber music by Elena Firsova. Call it an anthology, with solo works, duos and trios and additional participation of singers Maacha Deubner and Hannah Predley, string players Patrick Dawkins and Morgan Goff. The title of the CD takes its name from the commissioned piece the trio received from Elena Firsova in 2011 which will be featured in Radio Monalisa on September 6, 2015. The violinist and singer Yilian Cañizares is back with a great album, blending jazz, afrocuban music and even more. Invocación expresses the diversity of her musical universe, a passionate and fascinating album. Inspired by her Cuban roots but with falling into clichés. Between tradition and modernity, lyricism and mesmerizing rhythms, here we are, plunged in the heart of an eclectic and hybrid music. The music by Mélanie Bonis (France, 1858-1937) was published under the gender-neutral name Mel Bonis. She composed over 300 pieces during the course of her career, including works for solo piano, piano four-hands, pipe organ, chamber ensembles, songs (or in French mélodies,) choral music, a mass, and works for full orchestra. Long neglected, her music has gradually become more well known thanks to the fact that her work was published during her lifetime. This, too has lead Trio Alouette (Maria voor 't Hekke, mezzosopraan, Helen-Hilde Michielsen, Flute, Sylvia Wessels, piano) to exploring her music. Pridetime is the debut cd of Johanna Schneider and her quartet. Thanks to her single mother, she enjoyed a solid musical education, learned violin and piano as well as dance. The theater, musicals and training as a speaker followed. Johanna has sung ever since she can remember. She performed with her own band on stage when she was 14 composed her own songs at 16. This cd includes twelve songs of "Pridetime", which Johanna either all composed herself or for which created completely new arrangements in the case of her favorite songs "Moon Dance" by Van Morrison, "Throw It Away" by Abbey Lincoln, " Since I Fell For You "by Buddy Johnson," Ater Of March "by Antonio Carlos Jobim and " Turn Out The Stars "by Bill Evans. This is a musical journey through a very personal musical experience with unexpected discoveries and very different influences. Melancholic ballads, sizzling swing and African rhythms all merge together. A few tracks from this cd will be broadcasted (Radio Monalisa) on June 21, 2015. Words Fail Me is the title of a new anthology of works by Lois V Vierk (Ilinois, 1951). Although her music is not overtly programmatic, she often draws formal and poetic inspiration from dualistic images of the natural world, including the astronomical phenomenon of an eclipsing binary star, the border of a forest at elevation, and the mysterious power of the sea below its calm surface. ENSEMBLE EXPERIMENTAL is connected to the the EXPERIMENTALSTUDIO des SWR and views itself as an instrumental research group for music with live electronics. The members have been associated with the EXPERIMENTALSTUDIO as soloists for decades. They attempt with special commitment to do justice to the rehearsal and concert conditions specific to advanced live electronic music. The newest release is Folk Songs - Luciano Berio's work from 1964 opens the CD and includes new compositions by Francis Nurulla-Khoja, Marta Gentilucci, Mariana Ungureanu and Jamilia Jazybekova (all of them world premiere recordings). These works will be broadcasted on December 7, 2014 in Radio Monalisa. The Greek composer and conductor Konstantia Gourzi studied in Athens and Berlin. Today she is recognized as one of contemporary music’s most important champions: like Pierre Boulez and György Ligeti, a prizewinner of the ‘Christoph and Stephan Kaske Stiftung’. Tracks from this CD will be broadcasted on November 16th in Radio Monalisa. Dances and Canons is the debut ECM recording of both composer Kate Moore and pianist Saskia Lankhoorn. Moore was born in England in 1979 and lives now in the Netherlands. However, it is Australia, where she grew up, which has left the strongest impression on her creative imagination, its teeming natural soundscapes transmuted in her music of hypnotically-swarming pulse patterns and shifting, layered planes of sound. In Dutch pianist Lankhoorn (also born 1979), Moore has a dedicated and resourceful interpreter. “It’s impossible to listen to this music,” writes George Miller in the liner note, “and not wonder about the enormous technical demands it makes of the performer.” Moore and Lankhoorn have collaborated regularly since 2003. As well as compositions for solo piano, the program includes pieces for two pianos, four pianos and multiple pianos, realized in the Auditorio svizzera, Lugano, with Manfred Eicher as producer. Tracks from this CD will be broadcasted on October 26th in Radio Monalisa. In 2011 besloot Sonja Schwedersky een vijftal liederen te componeren op gedichten van de beroemde Chileense dichter en Nobelprijswinnaar Pablo Neruda. Het resultaat is verschenen op cd met andere kamermuziekwerken van Sonja én werken van Astor Piazzolla en Carlos Gardel. Meer info over deze componiste en CD is hier te vinden. In het programma van19 oktober worden een aantal werken van deze CD uitgezonden tijdens Radio Monalisa. self portrait in pale blue is de eerste solo album van Corrie van Binsbergen. Dat het ooit zover kwam is niet al te toevallig. Een paar jaar terug gaf Corrie een concert in Amsterdam, tijdens een Monalisa Matinee. Zij speelde toen just like that, en maakte veel indruk. Met 13 stukken duik je in haar muzikale wereld. Lees hier een recensie over hoe het allemaal tot stand is gekomen. Within the output of Sofia Gubaidulina, solo and chamber music occupies a position of prominence; she has written more than eighty such works. One of the earliest is a guitar solo and dates from 1960 and the longest work Sotto Voce for viola, double bass and two guitars finds is a world premiere recording. This varied and fascinating journey into the world of Sofia Gubaidulina’s chamber music is given us by a Munich-based group of eminent musicians. Und schiefe Scheitel kämmt der Wind (En scheve scheidingen kamt de wind) is de titel van de nieuwe cd van Renate Jörg. Zij is componist en zangeres en begeleid zichzelf op accordeon en piano. Stukken met meditatieve klanken en sobere muzikale motieven staan tegenover temperamentvolle, ritmische liederen. Op gedichten van o.a. Christian Morgenstern en Rainer Maria Rilke. "Ik heb gedichten uitgezocht, die gelegenheid geven voor een muzikale interpretatie. Het moest een combinatie worden waarin de muziek het ritme en de melodie van de teksten kon oppakken en een fijnzinnige reactie op de tekst kon geven". Een aantal tracks worden uitgezonden op 24 augustus via Radio Monalisa. Returning Souls - the five compositions by Shih-Hui Chen on this cd can be considered variations of an "ethnic style": they reflect her experiences of being able to return to Taiwan for a year in 2010. A number of these works will be broadcasted on August 17th on Radio Monalisa. GlamourTango marks a multimedia show of music and dance, theatrical set and lighting, created as a tribute to those women who quietly wrote the pages of Tango from the very beginning. This is a unique approach within the Tango style, since all performing artists on this show are female. A new CD release by includes compositions by Eladia Blazquez and Rosa Rodríguez Quiroga, among others. Karen Mantler (New York, 1966) is back, with a new collection of songs about the human condition and troubles large and small. Nonchalantly and disarmingly, Karen sings of homeless people in the park, the disappearance of friends, the frustrations of being monolingual, the challenge of improvisation, music with a mind of its own, and encounters with bill collectors, lawyers, snowstorms, and ash-spewing volcanoes. Through it all she sounds like a survivor, monitoring mishaps with deadpan humour. Sonic Halo is het nieuwe album van Tineke Postma en Greg Osby. De Nederlandse Edisonwinnares en de Amerikaanse jazz-ster zullen het album op het North Sea Jazz Festival 2014 presenteren. Op het album staat moderne, groovy muziek. Een opname met twee sopraansaxofonisten is ongebruikelijk en werd zelden eerder uitgebracht. Desondanks komen de stijlen van de twee muzikanten prachtig samen. Osby's moderne spel laat conceptuele en akoestische geluiden horen die samen komen met de melodische, Europese achtergrond van Postma. Het is drie jaar geleden dat Tineke haar laatste album uitbracht. Het album laat haar muzikale ontwikkeling van de afgelopen jaren zien, welke sterk werd beïnvloed door haar lange verblijven in New York en optredens met de top van de Amerikaanse jazzscene. Alive is het nieuwe album van de Japanse pianiste Hiromi met negen eigen gecomponeerde nummers welke volgens Hiromi staan voor de fases van het leven waar iedereen mee te maken krijgt tussen de geboorte en de dood. Daarnaast staat de titel Alive voor de vier jaar dat ze met het trio live speelt, het album "ademt, groeit, veranderd en evolueert". Just out, the latest release of this phenominal jazz pianist/componist. Marian McPartland about Hiromi in 2010: "It was very exciting having her on my program; I don't know where she got her technique. I think it's natural. And I think she is going to go very far." Hiromi was born in Shizuoka, Japan, in 1979, and took her first piano lessons at age 6. As a student, she absorbed a range of musical styles, and by age 17, she'd performed with both the Czech Philharmonic and Chick Corea. Her jazz mentors include Ahmad Jamal and veteran bassist Richard Evans. From June 25 through the 29th she is performing with The Trio Project at the Blue Note in New York. Thereafter off for a European tour. See her website for a date where she will be near you! The COB is a large orchestra, with strings, horns and rhythm section, founded in autumn 2010 by composer & conductor Hazel Leach. The members of the orchestra are not only improvising instrumentalists, but are also the composers. There is no fixed line-up: the composers can select instruments from the pool, to develop a brand-new and innovative orchestral repertoire with stylistic influences ranging from classical to jazz and from folk to free…. the music written for this band has no exclusion zones. Free Range Music is the title of their new cd and it displays the wonderfully broad and inspiring diversity of uniquely personal styles, with influences ranging from classical to jazz and from folk to free…. truly Free Range music. With works by Susanne Paul, Fee Stracke, Ruth Schepers and Hazel Leach, among others. Time to Burn is Judith Shatin’s third solo CD for innova Recordings. It show a rich cross-section of her acoustic and electronic music. Called “highly inventive on every level; hugely enjoyable and deeply involving, with a constant sense of surprise” by The Washington Post, Shatin’s music combines vivid timbral hues with perceptually clear forms. All the works share qualities of temporal intensity and an element of burning. Listen to Elijah's Chariot for string quartet and electronics in our broadcast on April 27th! Ladders of Escape is an Attacca-cd series featuring musicians searching for a "ladder of escape" freeing them from the limitations of their instruments and their repertoire. The bass clarinet is at center stage in this new release with soloist Fie Schouten. Works by Mauricio Kagel, Karlheinz Stockhausen, Rozalie Hirs, Robin de Raaff and Unsuk Chin. Valencia is Norwegian trumpetist's Hildegunn Øiseth new album richly filled with Iberian and Nordic tone palettes. The surroundings of Valencia, where this was recorded proved to be an important inspirational source for her third cd. A few tracks will be broadcasted in our program on Sunday, April 13th (Radio Monalisa). Piano Songs is the title of Meredith Monk's new cd. Written or derived from work composed between 1971 and 2006, the pieces inhabit Monk’s unique universe, as played by two of new music’s most distinguished interpreters, pianists Ursula Oppens and Bruce Brubaker. These pieces are ‘songs’ because they have strong roots in Monk’s pieces for voice, and because they are direct, specific, and imagistic. Harpiste en componiste Anne Vanschothorst lanceert deze maand haar nieuwe album: EK IS EIK. Klassieke muziekliefhebbers, maar ook jazz-lovers kunnen hun hart ophalen bij Anne’s genre-overschrijdende composities. Over de hedendaagse klassieke harpklanken zijn jazzy improvisaties gesampled. De artiesten die meewerkten aan het album zijn Saskia Laroo (jazz-trompet), Bob van Luijt (bass-gitaar), Ernst Stolz (viola da gamba) en Arthur Bont (percussie). Last year Kasia Glowicka was at Gdansk Music Academy with pianist Malgorzata Walentynowicz (first prize winner of the Gaudeamus Interpreters' Competition 2009) working with sound engineer Anna Kasprzycka. The result is RED SUN, seven tracks (55 minutes) of mind-captivating music for piano and computer. Glowicka: It definitely felt like a great experience. I somehow prefer this situation of concentrated, dedicated time, with the lights of desk lamps, darkness of the dimmed stage, sublimed, somehow impossible sound of instrument transmitted via multitude of microphones…. Greek composer Eleni Karaindrou's collaborations with stage director Antonis Antypas have generated some of her most powerful music. Medea, like her earlier work Trojan Women, comes out of this association. Created to accompany performances at the Ancient Theatre of Epidaurus, the music vibrates with emotional intensity. Sylvia Maessen is een veelzijdig componist. Uit haar pen vloeide jazz en wereldmuziek, maar ook het Nederlandstalig oratorium ‘Nova Zembla’. Sopraan Irene Maessen (haar zus) inspireerde haar tot het schrijven van klassieke liederen. In tien jaar tijd ontstond een afwisselend en verrassend oeuvre op gedichten uit alle windstreken en eeuwen. Op teksten van o.a. de zestiende eeuwse Tullia d’Aragona, Hadewijch en Wendela de Vos (1947). Musici: Irene Maessen (sopraan), Eleonore Pameijer (fluit) , Yfynke Hoogeveen (klarinet), John Anderson (klarinet), Jacobien Rozemond (viool), Nina Hitz (cello), Sylvia Maessen (contrabas), Hans van der Maas (accordeon), Arjan Roos (slagwerk), Marja Bon en Loes van Ras (piano). Jessica Krash is a composer and pianist from Washington D.C. In 2010 she received a Wammie (Washington Area Musica Association's Grammy). Her first cd released on the Capstone Records (obstructed view - new works for solo piano) featured her piano music. The major work on this new release is Be Seeing You, for string quartet and piano. This was commissioned by the National Gallery of Art and the National Museum of Women in the Arts and is inspired by 14 depictions of women found in these two museums. This work will be broadcasted in December on Radio Monalisa. Hiromi, is a Japanese jazz composer and pianist known for her virtuosic technique, energetic live performances and blend of musical genres such as post-bop, progressive rock, classical and fusion in her compositions. Her new (9th!) cd MOVE! has just been released and she will also be performing at the Dutch - Night of the Proms with The Trio Project, Anthony Jackson (contrabass) and Simon Phillips (drums). Cycles of the Moon is the new release from composer Ayala Asherov (Israel, 1968); a colorful and touching cross-section of works from the various cycles of her life. The music is tonal and intended to be accessible: "I didn't want to write what I though a listener would not want to hear. My guiding light, the melody, is something one can hold on to while exercising the imagination. Contemporary writing for Chamber Ensembles. This is the first release in a new series from the Contemporary Music Centre in Ireland. Works that re-imagine traditional music in diverse individual approaches. Music by, among others, Karen Power, Deirdre McKay and Linda Buckley. String Paths has just been released on ECM Records. It is a compilation of significant compositions for strings written between 2002-2008 as well as a celebration of Dobrinka Tabakova's professional musical friendships of over 15 years. Dobrinka Tabakova is also Composer of the Month June on Radio Monalisa. 12 compositions, 42 minutes of idiosyncratic ‘folk’ music, contemporary composition, improvisation, any and all of these may apply from moment to moment. Best known for her score for Stanley Kubrick's Eyes Wide Shut, Jocelyn Pook is an award-winning composer who writes music for film, television, theatre, dance and the concert platform. She won the Jocelyn has won the British Composer Award in the category Stage Works for her soundtrack DESH. Armadillo (1990–2007) is one large-scale piece in four sections lasting approximately an hour. One might think of the image of a Mayan temple, with a large broad base rising pyramid-like to smaller structures at the top. Almost all of the music’s sound is from drums, in a full range from high to very low. The trio’s playing is virtuosic, precise and finely modulated in color and dynamics. Jennifer Higdon on An Exaltation of Larks: The first time someone told me that a collection of Larks is called an “Exaltation”, I immediately thought, 'What a sound an exaltation of larks must make!' --How to capture the beauty of the idea of exalting and singing? A string quartet seemed perfect! Met haar tiende CD “Concert in Athens” keert Eleni Karaindrou terug naar de Athens Concert Hall, met een groep muzikale vrienden om zich heen zoals saxofonist Jan Garbarek, altvioliste Kim Kashkashian, hoboïst Vangelis Christopoulos en vele anderen. Karaindrou komt op 24 januari naar Flagey in Brussel voor het concert van "Het stof der tijden" ("Dust of Time")! Dit is het resultaat van de laatste samenwerking tussen de componiste Eleni Karaindrou en de Griekse cineast Theo Angelopoulos, vóór diens overlijden op 24 januari 2012. Vanaf "Le voyage à Cythère" (De reis naar Kythira) nodigt dit concert-portret ons uit op een zuiver muzikale reis, waarbij beelden van muzikale en cinematografische harmonie door ons geheugen zinderen. Trio ÆroDynamic is a trio specializing in the performance of both contemporary and medieval avant-garde music. Their new release is The Garden with Countless Window - Voice and recorders in a different light with music by a.o. Katarzyna Arnhold, Elizabeth Gaskill and Aspasia Nasopoulou. 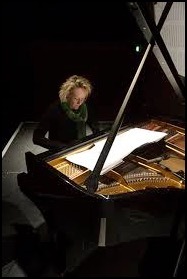 Tansy Davies (Bristol, 1973) is an English composer of modern classical and avant-garde works. She studied at the Guildhall School of Music and Drama and Royal Holloway College, won the BBC Young Composers' Competition in 1996 and has written works for the London Symphony Orchestra, BBC Scottish Symphony Orchestra a.o. performed by Joanne Polk, an exclusive Steinway artist. Here, The Cliffs is a retrospective CD of Hilary Tann’s orchestral music from 1994-2004. Radio Monalisa will be broadcastingTrancelation for solo piano on Wednesday, 15 February between 9 & 10 p.m. The 'sound around the sound'. Listening to the margins, where space, breath, and gesture open new territories where music might operate. Extended techniques join a Noh sensibility. Meet Eleanor Hovda's extraordinary, rigorous yet wispy, soundworld. Beloved of choreographers (including Baryshnikov and Nancy Meehan). Performed by: Prism Players, Eleanor Hovda, Libby Van Cleve, Jack Vees, Relache, William McGlaughlin, Cassatt String Quartet, California EAR Unit, Jan Weller, David Gilbert, Elizabeth Panzer, Lee Humphries, Dan Coody & Jeannine Wagar, among others. Aller-Zeitung review of the trio’s live performance earlier this year: "Enthusiasted audience listens breathlessly - Elisenda Fábregas' Voices of the Rainforest leads the three instrumentalists technically and harmonically together in a way that makes the audience listen breathlessly. The musicians with special sounds and breathing technics as well as knocking and pizzicato effects converted brilliantly the awakening birdcalls in the morning, the filtering light through the trees, the buzzing of the insects, the final breakdown of raindrops and the voices of the night into very lively pictures". The Land That is Not - A fine combination of folk music en contemporary jazz! Following a serious accident, Bacewicz concentrated on composition. Much of her music is written for violin, with seven violin concertos and five sonatas for violin and piano. On this new release, Violin Concertos Nrs. 2, 4, and 5. Sound is central in Mirjam Tally’s creations. Her music is a flow of playful contrasts where a sense of humor and poetic use of sound are blended. live music performed by Meredith Monk & Vocal Ensemble, string quartet and chorus. This is the 6th release jazz pianist Sylvie Courvoisier has made with the Swiss label Intakt Records. This recording is a symbol of cross-ocean friendship between composer Faye-Ellen Silverman and guitarist Volkmar Zimmermann and includes two pieces commissioned by Zimmermann and his Corona Guitar Kwartet. All the works feature guitar and range from works for solo guitar, guitar quartet and works for voice with guitar. Performers: Lisa Albrecht, trombone; Mary Barto, flute and alto flute; Andrew Bove, tuba; Kari Jane Docter, cello; Bruno Eicher, violin; Ann Ellsworth, horn; Jeanne Corinne Goffi-Fynn, soprano; David Jolley, horn; Michael Lipsey, marimba; Jo Williamson, mezzo-soprano. This month tracks from these two cds will be broadcasted by Radio Monalisa. 14 liederen op gedichten van Marius Torres voor zangstem en begeleiding van verschillende instrumenten. Canadian composer Ann Southam (1937-2010) and pianist Christina Petrowska Quilico collaborated on this project and together chose nine pieces from Southam’s mammoth piano series Glass Houses. With the composer’s permission Petrowska Quilico edited and revised these works for this recording just before the Southam’s death in 2010. Glass Houses Revisited are fiendishly difficult etudes for pianists. Fingers become whirling dervishes entering a mystical and ecstatic trance through suddenly shifting patterns and moods. Tracks van 26 componisten vertegenwoordigen verschillende benaderingen zoals tapemuziek, concertmuziek voor akoestische instrumenten en elektronica, live-elektronica, geluidsinstallaties en -omgevingen, elektronisch muziektheater, compositie en improvisatie. Met muziek van o.a. Rozalie Hirs, Alison Isadora, Anne La Berge, Cathy van Eck en Huba de Graaff. Lee Piu Ming has been hailed as the most 'unique genius to touch a keyboard in Canada since Glenn Gould’. This album reveals the artistry of someone who has clear influences from classical music, jazz and sonic exploration. These works, Incantation and Pulsar, will be broadcasted Monday, March 28th on Radio Monalisa. This work was premiered by the St. Petersburg Ballet in 1996 and recorded on dvd. Both the dvd and cd recordings are now available on the Limit / El Far Blau label. The cd will be broadcasted on March 14, 2011 via Radio Monalisa. Jennifer Higdon (New York, 1962) has become a major figure in contemporary classical music and makes her living from commissions, completing between 5-10 pieces a year. These works represent a range of genres, from orchestral to chamber and from choral and vocal to wind ensemble. Recently released on cd is The Singing Rooms, a violin concerto with an equally important part for chorus and was sparked by a request from violinist Jennifer Koh. Konstantia Gourzi (1962, Greece), is een belangrijke pionier van hedendaagse muziek. Ze is oprichtster van verschillende nieuwe ensembles en ze is professor aan de Hochschüle fur Musik und Theater in München. Op haar nieuwste cd Conjuctions - Synápsies 7 werken waarin zij een brug slaat tussen tradionele muziek en de hedendaags manier van uitdrukken. Haar echte naam was Zoila Augusta Emperatriz Chavarri del Castillo, haar bijnaam was: de Inca Prinses. Yma Sumac begon haar carrière als zangeres bij de Compañia Peruana de Arte, een groep van 46 dansers, zangers en musici. De groep toerde door Zuid-Amerika. In 1946 verhuisde Yma Sumac naar New York. Zij produceerde een aantal legendarische lounge-opnames van Zuid-Amerikaanse volksliederen, gerelateerd aan de Inca-cultuur. In 1950 begon haar succesvolle samenwerking met Capitol Records, er werden albums uitgebracht in verschillende stijlen, zoals mambo dance, Peruaanse folksongs, alles in een aantrekkelijke jazzy Hollywood stijl met begeleiding van geweldige orkesten. De combinatie van haar unieke stem, haar exotische uiterlijk en haar extravagante persoonlijkheid maakte Yma Sumac razend populair bij het Amerikaanse publiek. Ze kreeg filmrollen en werd in 1955 Amerikaans staatsburger. In 1960 begon Yma Sumac aan een wereldtournee die 5 jaar zou duren. Prins Bernard en Koningin Wilhelmina waren enorme fans van Yma Sumac. Tot aan het eind van haar leven trok Yma Sumac volle zalen. Het Nederlands Muziek Instituut (NMI) organiseert samen met de Vrienden Nederlandse Muziek een seminar rond de Nederlandse componiste Anna Cramer (1874-1968). Er zijn lezingen over het leven en werk van deze componiste die een aanzienlijk oeuvre heeft geschreven dat van bijzondere kwaliteit is. Het NMI heeft enkele jaren geleden al een eerste bundel met liederen van Cramer uitgegeven. En de aanleiding voor de vervolguitgave van nog eens twee liedbundels ontstond nadat dirigent Stephan Pas een concertserie initieerde met een nieuwe orkestratie van enkele liederen van Cramer, en de CD-opname die daaruit voortvloeide. Rozalie Hirs presenteert op zaterdag 13 november haar nieuwe cd 'Pulsars' in Cineac Sonore, de elektronische luisterkamer van festival November Music in 's-Hertogenbosch. De officiële presentatie is om 15.00 uur. De entree is gratis. Op het nieuwe album staan drie elektro-akoestische composities van de Nederlandse componist/dichter, te weten 'Pulsars' (2007), 'In LA' (2010) en 'Bridge of Babel' (2010). Alle stukken bevatten gedichten door Rozalie Hirs. Een bloemlezing van werken voor viool en piano uit de de 19e en 20ste eeuw. Met grote namen als Ethel Smyth en Elizabeth Maconchy en minder bekenden als Poldowski, Phyllis Tate en Ethel Barns. Patita Salada is de titel van de nieuwe cd van Edith Tamayo (Mexico, 1972). Daarop een mix van traditionals en eigen materiaal; vooral akoestische materiaal in een opwekkende Latin stijl met heldere glanzende gitaren en rijke percussie. Dat is de titel van de 4de cd van Tineke Postma, verschenen op de nieuw jazzlabel van Codaex, EtceteraNow. Vorig jaar dook Postma een studio in waar acht eigen composities werden opgenomen. Dat was in Brooklyn, NY waar ook pianist Geri Allen en drummer Terri Lyne Carrington van de partij waren. Op de nieuwe cd van Sally Beamish (UK, 1956) staan drie orkestwerken: VIolin Concerto (1994), Callisto (2005) voor fluit en orkest en haar Symphony No.1 uit 1992. Dat is de titel van de nieuwe cd van contrabassiste/zangeres/componiste Esperanza Spalding. combineert soul, jazz . Een strijktrio voorziet Spalding's band van een klassiek touch. woensdag 27 oktober - Muziekgebouw aan 't IJ - 20.15 Amsterdam. Title of the debut album from Amsterdam’s Trio Scordatura. A cd full of dark, gothic beauty with music by 7 Irish composers including Linda Buckley and Judith Ring. Take a look at the interview Jonathan Grimes did with these two composers. Jazz-zangeres Soesja Citroen heeft 12 eigen composities gebundeld en uitgebracht in boekvorm. Soesja’s Songbook bevat arrangementen, lead sheets, songteksten en aanvullende informatie. I would like to share with you the excitement of the long-awaited release of the 2CD set PIANO MUSIC REVISITED from Unseen Worlds.The set compiles out-of-print favorites "Piano Works" and "Concerto for Piano and Orchestral Memory", "Variations on the Orange Cycle" (included in Chamber Music America's Century List), and other previously unreleased music. Nearly all of the music has never been available on CD, and is newly re-mastered for digital presentation. To mark this momentous occasion, I was invited by Arts Olympus to perform a solo piano program in the first 2010 World Olympus of the Arts on the Queen Mary ship in Long Beach, California on June 18-20, 2010. In addition, Arts Olympus is having a fundraiser hosted by the Gershwin Hotel (7 West 27th St) where I will perform excerpts from the new CD and a new set of recently composed Tangos. This will take place on Sunday, April 25 at 4PM. I hope that you will join us on April 25 within the incomparable orange walls of the Gershwin Hotel.